Can Blackpool do Portsmouth a favour at Sunderland tonight? Sunderland have the chance to leapfrog Pompey in the table when they host to Blackpool at the Stadium of Light tonight. The fourth-placed Black Cats sit two points behind the Blues (59 points) – who currently occupy third spot in the League One standings – but have played two less games than Kenny Jackett’s side. A win for Jack Ross’ Wearsiders will provide another setback for Pompey, who sat four points clear at the top of the division, and nine better off than Sunderland, when they blew them away in that 3-1 win at Fratton Park on December 22. So what’s the odds of the Black Cats themselves suffering a bump in the road on their way to a possible return to the Championship? Well, talking of odds, the bookies don’t anticipate Blackpool ending Sunderland’s current 10-match unbeaten run, with the defeat to the Blues before Christmas representing their last. Both Skybet and Bet365 see the hosts as clear favourites to win (both ¾ on), with the Tangerines sitting at 18/5 and 17/4 respectively for an away victory. With Ross’ troops unbeaten at home in the league all season, that can be expected. Their 30 points from those 14 games is bettered only by Luton (42), Barnsley (35) and Chalrlton (34). 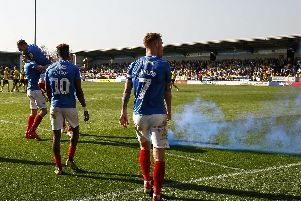 Pompey, by the way, have 28 points from their 15 home games played. But what shouldn’t be discounted is Blackpool’s form in recent weeks. They’re currently on a run of three wins and two draws from their past five league games (11 points) – including a 1-0 win against Pompey on January 12. That sequence of results places them above the Black Cats (7 points) in the form table – and, of course, the Blues, who have accumulated two points from their past five league outings. Blackpool’s away form this season shouldn’t be ignored either. They’ve lost only four on the road this campaign – a record bettered only by Sunderland (two defeats) and Pompey (3). Five of those have been wins – including that recent 1-0 victory against Pompey – while they’ve also drawn five, proving their no pushovers on their travels. Countering that, though, will be Sunderland’s home form, which, as mentioned above, makes for impressive reading this term. Blackpool’s goals conceded record, however, will make fans sit up and take notice. Their 2-0 win over Walsall on Saturday provided their 15th clean sheet in the league and their 17th in all competitions this season. They’ve only conceded twice in their past five matches, with the Black Cats conceding four and registering one shutout in the same period. Blackpool have also scored two goals in each of their past three matches – giving their forwards plenty of confidence ahead of the Stadium of Light clash. Yet the last time Ross’ side conceded two or more was at Fratton Park three days before Christmas. Meanwhile, only four other teams have managed that this season – Barnsley, Walsall, Peterborough and Burton. So there you have it, enough stats to show three home points cannot be taken for granted tonight and that the Blues could stay third in the table – for now! However, there’s also plenty to suggest that Sunderland have the capabilities to bypass the Blues and maintain their own push towards promotion.